You may not be able to leap on Pointe or prance around in yardage of gossamer tulle, but every girl with visions of sugarplums as a tot, can now star in the lead role as Prima ballerina ala topknot. The look is clean, neat with a high polish shine. Spray damp hair with product to create shine. Pull hair back into a high pony as close to the crown of the head. Use elastics to hold into place. Separate ponytail into three or four sections, tease gently at the base for more volume. Wind sections around each other to create a wrapped effect and secure with pins. Hide any loose ends and smooth any fly-aways with spray. Control the amount of spray to keep it light and not ultra stiff. 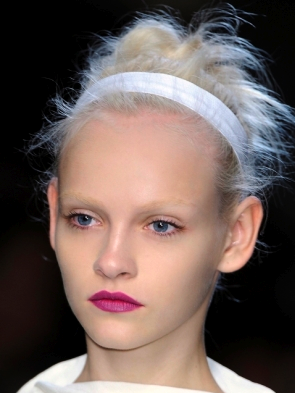 For a messy, not so polished bun, tease generously after pulling into a bun. Continue with the same steps, making separate sections. This time, wind in all directions creating a twisted effect, building the bun. A touch of frizz breaks the traditional sweetness of this look and adds texture to an expected smooth finish. Add a band or adornments for extra twirl-worthy flair. Go ahead, you know you want to!